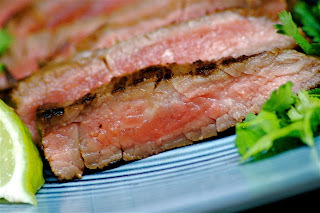 I'm a big fan of flank steak and for good reason. It's a great cut of meat on the cheap. Sure I'm extremely fond of a thick, juicy, tender T-Bone, I also really like a New York Strip but I like those steaks cooked over a hot fire grill and there are two reasons I don't do the grilling around here: First, I am a total spaz/clutz and will likely light my hair on fire but the biggest obstacle I face in the grilling department is a certain someone I call my husband otherwise known as The BBQ Assassin. He takes his grilling very seriously and I'm not allowed to touch his BBQ. I'm not totally unconvinced that he loves his BBQ a tad more than me. Don't worry I'm okay with it. I can relate because it's a rare occasion that I ever let him in my kitchen. I don't like him touching my stuff either so we're tied. Anyway, back to the flank. There happens to be that thing called work in this life therefore I don't always have my BBQ Assassin at my beckon call and that is where this flank steak comes into play. Sure it's delicious when it's grilled but I actually prefer it cooked in a super hot cast iron skillet for a few minutes until it gets nicely charred. Now, the thing about flank steak is that it's a tough cut of meat so it really needs to be marinated in order for it to become tender. My current favorite is this Bobby Flay recipe from his book Bobby Flay's Boy Gets Grill. While the ingredients in this marinade all have strong flavours, surprisingly they lend a nice subtle taste to the steak. Luckily I can enjoy a nice tender steak whether my husband is home or not. Girlfriend likes her steak. 1. Combine all of the marinade ingredients in a storage container. Place the steak in the marinade. Cover and refrigerate for at least 2 hours, flipping the steak once. Marinade at least 2 hours or up to 8 hours, flipping the steak periodically. 2. Remove the steak from the marinade and pat dry. Heat a cast iron skillet to high heat. Coat the skillet with vegetable oil. Place the steak in the skillet and cook 3 minutes. Flip the steak and cook another 2-3 minutes (if you prefer your steak cooked more than medium rare, reduce the heat to medium and cook an extra 1-2 minutes on each side). 3. Remove the steak from the pan and allow it to rest 5 minutes before carving. NOTE: when carving the steak it's important to carve it against the grain which means finding the horizontal lines of the meat and carving the other way. Thanks Rebecca, I do love the balsamic in this recipe. That steak must be perfect! I think I will give your recipe a try soon. Thanks for the step by step instructions.